"To be honest when I think of Lara Croft, the first thing that comes to mind is her chest." It is difficult to decide just which factor made the Tomb Raider series of computer and Playstaion games among the most popular ever created. Could it be the strong female character at the center, running through caves defeating villains better than other male heroes that had come before her? Or could it be the unheard of 3-D game play of the original? Or could it be that Lara Croft isn't your typical video game heroine, sporting matching pistols and a physique that most models would kill for; the perfect woman for most teenage boys... and perhaps their fathers. Now, a sure sign as any that a pop culture trend has gone beyond being a household name, there is Lara Croft: Lethal and Loaded, a 50-minute documentary that tracks the rise of Lara from sketch to superstar. 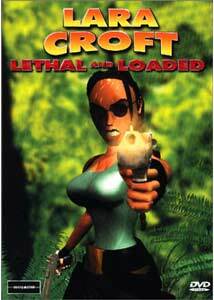 Produced in England before the release of the live action film blockbuster, Lethal and Loaded isn't an inside look at the creation of the video game franchise, as much as it is a look at how the popularity of the Tomb Raider games has effected those who play it. From a man whose body is festooned in Lara Croft tattoos, to a woman whose entire wardrobe is dedicated to Lara look-alike outfits, it is the power to change lives of ordinary people that make this documentary about a video game worth a look. Divided into twelve sections, the most enjoyable parts of Lethal and Loaded are those that focus on the aforementioned fanatics and the lengths to which they'll go to get more and more of Lara. Perhaps the most humorous story is that of an English football goalie whose late night ritual of playing Tomb Raider until his thumbs hurt was made public when he admitted that his concentration was wrecked due to a night of Lara Croft. As far as production values go, the documentary is as nicely produced as the game on which it focuses. Featuring numerous clips of the Tomb Raider games, the story moves along at a brisk pace while never becoming tedious or uninformative. For those who wish to know more about the game's origins (including Lara's hometown) this disc is certainly worth a look. Image Transfer Review: Presented in a 1.78:1 widescreen ration, Lara Croft: Lethal and Loaded doesn't offer the eye-popping visuals typical to the Tomb Raider video games. Scenes taken from the games appear grainy, and the strong uses of blues and light colors seem to show some bleeding. Overall this isn't an awful transfer, but given the subject matter I had hoped for more. Audio Transfer Review: The Dolby 2-channel mix for Lara Croft: Lethal and Loaded is largely center channel focused with the light intermittent musical score in the side speakers. Dialogue sounds natural and clean throughout, and the score has nice depth and clearness. Extras Review: No extra features are offered. As an avid video game fan I can honestly say that the Tomb Raider series to this day remains the only game that frustrates me enough to throw my controller against the wall. The series is addicting, and Lara Croft: Lethal and Loaded offers a close-up look at those who treat the Tomb Raider games as a drug.